Presented 5 videos. The medical chief of Valencia, Pacual Casañ, punches Damián, who receives a bottle. The Valencia alleges Bruno's provocation. El Getafe has challenged before the Spanish Football Federation (RFEF) the arbitration report drafted by the referee Estrada Fernández in relation to what happened during the Valencia-Getafe match corresponding to the round of the round of 16 of the Copa del Rey. Various Getafe players are totally against the accusations that are imputed in the record for alleged events that took place in the locker room tunnel. 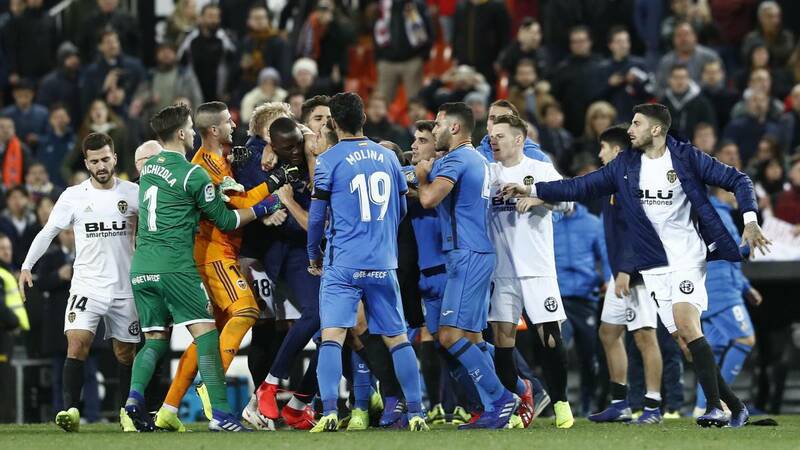 At the same time, and supported by the images of several videos that circulate through social networks, Getafe has decided to denounce several employees of Valencia for their attitude during the match and in the final tangana. El Getafe has contributed five videos to defend themselves , presenting the brief of challenge in time and form because the term was until 14:00 hours on Wednesday. In the images of those videos, it can be seen how the head of the medical services of Valencia, Pascual Casañ, punches Damián on the back when he calmly left the lawn. In another is seen as a plastic bottle thrown from the stands just hitting the head of Damián. Además, the azulón club has planned to denounce the attitude of the security employees of Valencia, as well as the staff of the technical body. El Friday, the sole judge of the Competition Committee must decide if the videos that Getafe has contributed are conclusive evidence to determine penalties. El Valencia, as reported by Julián Burgos, has also done his homework and has presented, in time and form, previous allegations due to the red card that saw Mouctar Diakhaby, at the end of the match. The club has provided a video as evidence in which the attenuation is based on a previous provoking of a player of Getafe (Bruno) in which it is seen that throws a pitch to the local bench, a few minutes before the end of the game.